Preheat oven to 400°F. Spray large shallow roasting pan or jelly-roll pan with nonstick cooking spray. Combine broth and oil in small bowl. Combine parsnips, carrots, and 3 tablespoons broth mixture in prepared pan; toss to coat. Roast vegetables 10 minutes. Add bell pepper, onion, and remaining broth mixture to pan; toss to coat. Push vegetables to edges of pan. Place pork in center of pan; spread with mustard. Sprinkle pork and vegetables with rosemary, salt, if desired, and black pepper. Roast 25 to 30 minutes or until vegetables are tender and internal temperature of pork reaches 155°F. Transfer pork to cutting board; tent with foil and let stand 5 minutes. 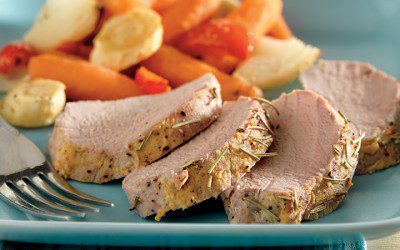 Cut pork crosswise into 1/2-inch slices; serve with vegetables and any juices from pan. Serving size: 3 ounces pork plus 2/3 cup vegetables. Exchanges per serving: 1 Bread/Starch, 3 Meat.